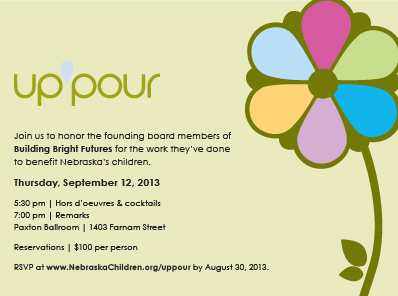 UpPour, the annual award gala and fundraiser hosted by Nebraska Children and Families Foundation will take place at Omaha’s Paxton Ballroom (1403 Farnam Street) on Thursday, September 12, starting at 5:30 pm. The Paxton Ballroom was chosen as a venue for the building’s unique architecture and historical character. The second floor ballroom and mezzanine will be transformed into an enchanted garden for the event, complete with winding paths, landscaping installments and glowing “drops” of magic to add a touch of whimsy. Guests will enjoy a selection of hot and cold hors d’oeuvres and cocktails preceding the evening’s program. The program itself will celebrate the honoree, recognize the generosity and good work of contributors and attendees, and provide a video recap of how the year’s efforts have affected the lives of children. Anyone who wants to attend can reserve their space at http://www.nebraskachildren.org/uppour. The dress code for the evening is business casual, and free parking will be provided.